Our congregation’s group, made up of 28 intrepid explorers, just arrived here after traveling the country for a week. In that short time, we have taken a jeep tour through the stunning Ramon Crater, floated in the Dead Sea, visited our friends at Ohel Avraham in Haifa, and explored Tel Aviv and the Eshkol region. We have met Jews and Muslims. We have prayed and walked and hiked. We have picked fresh vegetables and made classic Bedouin jewelry. All that, and we haven’t even begun to explore Jerusalem! Most impactful, I think, are the stories we’ve heard; stories from people who are working every day to make this desert bloom. We’ve heard from those committed to helping Israel live up to her highest ideals, protecting the civil rights of all its residents and advocating for those seeking refuge here. These stories have challenged us to wrestle with the complexity of Israel even while celebrating her extraordinary accomplishments and beauty. We look forward to telling you more about our experiences when we return next week. 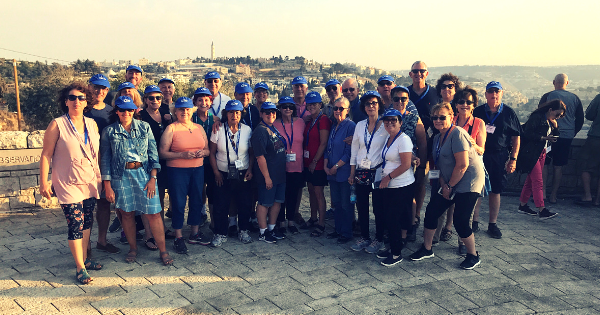 I’m grateful for the opportunity to lead our congregation in exploring Israel together, in our travels as well as through meaningful dialogue in our synagogue. I hope you’ll join me on our next trip to Israel, and if you’re interested, please let me know! Shabbat Shalom, and see you soon!